(CNN) -- The head of the Organization of American States arrived in the capital of Honduras Friday in an attempt to pave the way for a return to power by ousted President Manuel Zelaya. 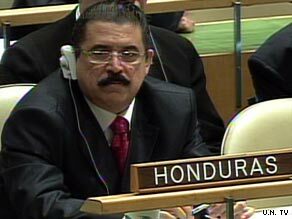 Ousted Honduran President Jose Manuel Zelaya appears Tuesday at the U.N. General Assembly. Jose Miguel Insulza, the secretary general of the OAS, arrived Friday afternoon. The OAS has threatened to expel Honduras if Zelaya is not reinstated to the presidency. Zelaya was ousted in a military-led coup Sunday and transported out of the country. The same day, the Honduran Congress voted to install Roberto Micheletti as interim president. Asked about a proposal to possibly move up elections, currently scheduled for November, Micheletti told reporters on Thursday: "We are totally in agreement with this as long as it is done within the law. I have no problem or objection to this, if this is the way we can resolve this type of problem." Insulza will notify Honduran "stakeholders" of the terms of the resolution, according to an OAS news release. Speaking at a news conference from Panama City Thursday, Zelaya said Insulza will not negotiate with the provisional government, which has not been recognized by the OAS or the United Nations, but will simply deliver the terms of the resolution. The Saturday deadline, Zelaya said, "is more than enough time" for Micheletti to step down. But Micheletti and his cabinet have said they will arrest Zelaya if he returns. The Honduran attorney general has said an arrest warrant has been issued for Zelaya for violating the country's constitution. At the center of the dispute was a referendum that Zelaya had vowed to carry out even after the country's supreme court and congress found it illegal. The nonbinding referendum could have opened the door to the creation of a constitutional assembly to modify the country's charter. Opponents accuse Zelaya of having sought to rewrite the constitution to allow him to run for re-election. Zelaya has denied that was his intent. But international support for the new government has been virtually non-existent. On Thursday, the European Union presidency announced that all EU ambassadors had left Honduras. Also Thursday, the U.S. State Department said it was suspending some aid programs to the country. Earlier, the U.S. military, which has trained Honduran forces for years, postponed some planned exercises with the Honduran military until the situation in the country settles down. Zelaya narrowly won the presidency in 2005 with 49.8 percent of the vote to 46.1 percent for Porfirio "Pepe" Lobo. Military interventions were once common in Latin America, but civilian governments have held sway since the 1980s. Before Sunday, the only other barracks revolt this decade was an unsuccessful 2002 coup attempt against Venezuelan President Hugo Chavez, when the military displaced him but backed down days later and allowed his reinstatement. The OAS comprises 35 nations from North, Central and South America and the Caribbean and, according to its Web site, was formed to cooperate on shared interests and to promote democratic ideals.